The intermediate bulk containers (I.B.C.’S) carried by Jones Barrel Company are containers that are composed of an inner high-density polyethylene bottle enclosed in a metal cage. • These containers are mounted to a pallet designed base, generally made of poly or steel. 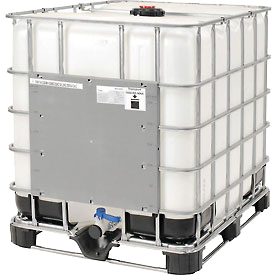 • General sizes are 275 gallons and 330 gallons. • Make us aware if you need a specific discharge or if your container needs to be UN approved. 275 gallon – 135 lbs. 330 gallon – 195 lbs. Please be sure to let us know if there are certain specifications you require!